The red and white striped lighthouse at the foot of Beachy Head in East Sussex is an iconic landmark in this busy section of the English Channel, its flashing light continuing to warn shipping of the submerged reefs that lie out from the chalk cliffs. Known locally as ‘The Devil’s Headland,’ this area’s unforgiving combination of jagged rocks, notorious currents, and capricious south-westerly winds, have been the cause of many shipwrecks and deaths. In 1691, the court of William III and Mary was petitioned by Thomas Offrey, Lord of the Manor of Birling, for the urgent need of a warning light. “Being sorely troubled by the great number of ships and lives lost every year at, and near, Beachy Head in Sussex. It sheweth that a great number of ships have been heretofore lost and some are lost every year near “the Beachy” in Sussex, being a very dangerous coast in the dark; and whereas nothing is so good to prevent the same loss as a lighthouse.’ This plea was referred to Trinity House, Deptford Sound, the General Lighthouse Authority for England, Wales, Channel Islands and Gibraltar, where it was duly recorded, pigeonholed and forgotten. Credit for Beachy Head’s first warning light being built at this location must, in part, go to the efforts of one caring, God fearing and determined man, Jonathan Darby, (1667-1726). Born in Appleby, Westmorland, he married Anne Segar at the age of fourteen. Having studied and become Bachelor of Arts in 1689, he gained entry to the church and was ordained in 1691, by Gilbert, Bishop of Sarum. A year later he secured an appointment as curate at Littlington church, in Sussex. Accompanied by his wife, they travelled in a carrier’s wagon to Alfriston, and then walked the rest of the way to their new home. The village was small, just a few thatched cottages, rectory, farmhouse, an inn and a Norman church. Although he busied himself with church affairs, Jonathan was aware there was poverty all around him, many parishioners existing just above starvation level. The financially destitute could be taken to the dreaded workhouse, so, to help add to the family income, the women worked on the farms, especially during harvest time and the children earned pitifully small amounts of money in any way they could, and were often exploited from an early age. A shipwreck could bring rich pickings, stealing the cargo was an accepted way of life, helping to ease the deplorable conditions endured by many. Jonathan was strongly opposed to this, although he was compassionate enough to understand the reasons why. If a ship ran aground, word quickly spread, and the villagers, laden with baskets, headed for the wreck, looking for any salvageable items. Jonathan would go along to see if any unfortunate mariners could be saved. If not, he would arrange Christian burials. Having taken up the offer of a full time appointment to East Dean parish, he administered ‘God’s comfort to my cherished flock.’ After witnessing a number of wreckings and discharging the last rites over so many graves of unknown mariners in his churchyard, Jonathan became determined to give practical help and try to save further loss of lives. Under a nearby promontory, situated about a mile from Jonathan’s home, there were a number of rough caverns that had been used by smugglers. This was an ideal location to carry out his plans to provide a warning light to passing vessels. Working with a pick, chisel and axe, and often wearing his familiar beaver skin hat, Jonathan spent all his spare time hewing out a series of tunnels in this cliff face, which he reached by a staircase in a chimney shaped hole leading up from the beach. One visitor, years later, described how they had to clamber up the chimney, using notches for their feet, ‘whilst holding onto a rope, which was suspended from a ring and staple driven into the chalk above. The chimney would admit just one person. At the top there were four or five roughly cut steps which led to the ‘Hall,’ from where you could look out of an arched window, which Darby had enlarged from its smuggling days. The window was about fifty feet above the beach. The ‘Hall’ would have held up to thirty-five persons. There were two alcoves in the ‘Hall,’ one was probably made by smugglers for defence purposes, and the other alcove was used by Darby for his lantern store. One of the caves had a balcony some twenty feet above highest water, accessed through a chimney from the Downs. Another adjoining cave was lit by two lanterns set into the wall. This room was basically furnished, with a well worn carpet on the floor, the walls blackened by candle smoke. Ropes and other rescue equipment were stored in side recesses. During rough or stormy weather, Jonathan would listen as the wind and rain lashed against the window panes, and then say to Anne, ‘I must be about the Lord’s duty.’ As he donned his heavy winter coat, Anne would reply, ’God will look after you, I know that.’ Bent over almost double against the full force of the wind and rain, Jonathan would scramble along the boulder strewn beach, every step an effort, and then wearily pull himself up the rope to his cold, damp sanctuary. Although, often exhausted, he would sit there making sure the bright, warning light he’d fastened above the balcony, didn’t go out. His Bible, kept on a nearby table, was his companion. Opening it up, he would give thanks for a safe journey to the cave during treacherous weather, and asked God’s blessing ‘for those in peril on the sea.’ Due to his efforts, the loss of ships decreased, and many sailors’ lives were spared; thus, he achieved, single handed, what many men had only talked about. Some villagers thought he was mad, others feared they might lose their lucrative income from stripping wrecks. ‘He will have us in the workhouse,’ one labourer was reported to have said in the local Tiger Inn. After the death on April 24th 1707, of their eldest son Samuel, and the loss of a fifth baby at birth in 1708, Jonathan became increasingly withdrawn, and his cave became almost a second home. Local gossip suggested that he had been driven there ‘by the vinegary tongue of his wife, from which to escape he nightly sought the quiet of his cave existence.’ Little did they know that spiritual guidance was urging him on into almost obsessive behaviour to try and save as many lives as possible. Who died on 26th October 1726. With no light to warn shipping of the dangers of this rocky coastline, there were many more disastrous shipwrecks. In the early 1800’s, a naval captain who had survived when his vessel sank, vigorously demanded positive action, writing strongly worded letters to the press, government and Trinity House. This brought about the erection, on the headland called Belle Tout, of a temporary, experimental weather-boarded lighthouse. A more permanent structure, Belle Tout lighthouse, came into operation in 1834, but never lived up to expectations, as the light was often obscured by sea mists. In July 1899 work began on the famous Beachy Head lighthouse sited on the foreshore and the light was first switched on October 2nd 1902. 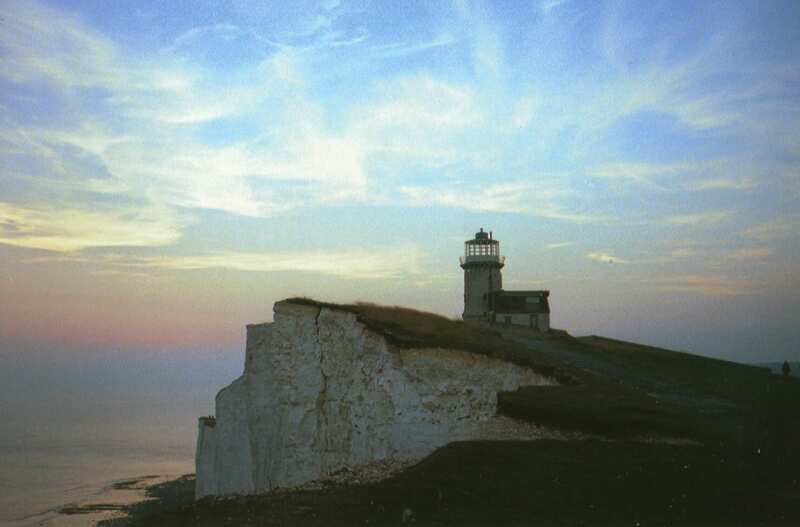 Jonathan Darby’s primitive cliff face lighthouse was the first Beachy Head light. I found this webpage while searching for information about Parson Jonathan Darby who was my 7 great-grandfather (nine generations ago). A man named Jonathan Darby settled in New Orleans, Louisiana in the year 1719 as a director of the Bernard Cantillon concession of the Company of the Indies (a British concern that ran Louisiana on behalf of the French government). The Company of the Indies caused a huge financial collapse in France around 1720. I have wondered what (if any) role Jonathan Darby had in the collapse. This Jonathan Darby claimed to be the son of Parson Jonathan Darby and Ann Seger. No one to my knowledge has ever found evidence of this Jonathan Darby being the son of Parson Jonathan Darby. Your story lists their other children but not this one. No other story of Parson Darby I have read has any information about Jonathan Darby, Jr. Was he actually the son of Parson Darby? Was he disowned (the son of a Church of England minister going to French Catholic Louisiana)? Based upon the assumption that Parson Darby is my ancestor, I brought my family to East Dean on July 6 last year. We found his tombstone and took pictures of it as well as with my daughters and me around it. We also toured the Parish Church of St Simon and St Jude (very beautiful). By Jonathan Darby, Jr. coming to Louisiana (and if he is the son of Jonathan Darby), Parson Darby has tens of thousands of descendants in Louisiana, Texas, and elsewhere in the United States. Thank you again for the story of the first Beachy Head Light and Parson Darby. Jeff, I alm also a descendent of Jonathan Darby and Marie Corbin Bachemin, and currently doing reasearch on the topic above you just wrote about. Cannot find any official sources about him being the son of Jonathan Darby (Parson). My mother has been doing this family research off and on for years, and recently I joined her. My mother is 86 years old now, and she recently told me that her great grandfather, Adolph Darby, told her Jonathan left England because he was a member of the Jacobites. Adolph Darby said the people in England wanted to kill him, and that is why he came to Louisiana. We are thinking that he was disowned maybe because of his involvement in this conflict. Marie Corbin Bachemin is buried in New Orleans St Louis cementery number 1, we are going to try and find her grave site January 4, 2016, and also to do more family research on Marie this May, in St. Malo, France, they said they had a lot of information on her family. Please let me know what you think about the reason he may of been disowned. This is a updated version of my initial statement regarding Jonathan Darby. There was a misunderstanding in the information that was told my Adolph Darby, then passed on to his relatives, about Jonathan Darby. It was noted that Jonathan Darby had left England and came to Louisiana because the English government wanted to cut off his head. That Jonathan Darby was a member of the Jacobites which was mentioned in a book titled, The Darby’s of Louisiana, author unknown. The book was purchased years ago in a bookstore in New Iberia, Louisiana by my mother. I have been unable to locate this book at this time, but I am still looking. Her copy of the book was lost in Hurricane Katrinia. With all of this in mind, it seems like Parson Darby may has disowned his presumed son, Jonathan Darby.